The Dawson Blues Women’s Basketball Team has once again wrapped up a very successful season. 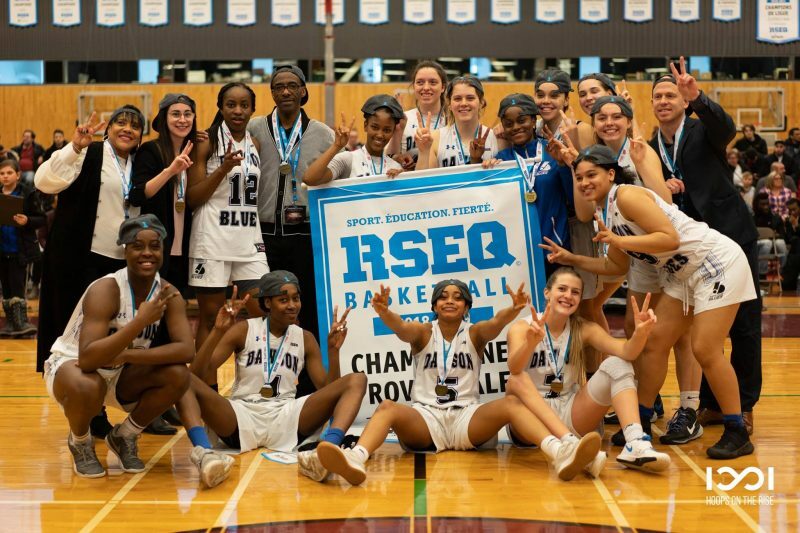 For the second year in a row, the Dawson Blues women are Provincial Champions in the D1 Women’s RSEQ Conference Basketball. The provincial champions then went on to play at the Canadian Collegiate Athletic Association’s national championships and placed third in Canada. Proud coach Trevor Williams defines success as nurturing the sisterhood of the team so that players maintain a high level of motivation to play at a top level and keep their marks up at the same time. Trevor has been coaching the women’s team since the 2001-2002 season. The former Olympian’s vision is that “Dawson is the place to play serious basketball with a goal of getting into university.” Two to three times a week, there is a mandatory study hall for the players. Any player who is struggling will get the help they need, he says. The basketball experience leaves a mark on the players. Trevor says that young women who played 10 years ago check in on the team and follow their sisters on and off the court. This team worked hard and the scholarships offered to all graduating players is proof. Roxane Makolo (point guard graduating in Social Science), who was chosen to play on the All-Canadian team, is considering several scholarship offers. Two graduating players are going to the U.S. on full scholarships to play Division 1 Women’s Basketball: Sorelle Ineza (point guard graduating in Social Science) is going to Hofstra University on Long Island in New York and Dahomée Forgues (shooting guard graduating in Health Science) is going to Robert Morris University near Pittsburgh, Pennsylvania. Two other graduating players are going to Canadian universities on scholarships: Ekaterini Stoupas (power forward graduating in Social Science) is going to Bishop’s University and Sara Esongola Biango (point guard graduating in Pure and Applied Science) is going to Ontario Tech University.